They used to exchange some things with Siberians, not with money but with things like that [boots]. Beads this long [approximately twelve inches] cost a whole walrus skin. The embroidered designs on these reindeer skin boots show that they were traded to St. Lawrence Island from Siberia, where Yupik women specialize in this type of sewing. The leg of each boot took all four legs of one reindeer to make. Estelle Oozevaseuk: I know that’s from Siberia originally because of the white reindeer hair. We call it segeni [fancy stitched design using reindeer chin hair]. This kind of trimming originally came from Siberia. Whenever they got reindeer leggings [hide from leg] from Siberia, they tried to make them [boot uppers] fancy — not this kind of trimming but like a patchwork with red. Estelle Oozevaseuk: Yes, that’s men’s boots. This is a winter dress [boot]. Reindeer people [Siberians] often make those because they have nothing but reindeer. See [upper] the reindeer leggings and their trimmings. They can make good leather out of reindeer skin too. Aron Crowell: Did people used to do that kind of embroidery? Estelle Oozevaseuk: The only one who can do it is a Siberian woman that came to [St. Lawrence Island] — Mrs. Apassingok can do this kind of [embroidered] trimming. She tried to teach me, but I wasn’t interested in using reindeer hair. My sister learned. I always used to make them [boots] overnight with no trimming like this. The latest ones that I made have some patchwork trimming and beadwork. I never do this kind of trimming. It’s too delicate to work on. Those are very nice, the [embroidered trimming made with] mane hair of reindeer. Sangaawat amenqun atullepaaghruget [what do you call the ones who sing very well]? The place isNevuqaq [in Chukotka, also called Lavrentia]. They’re good with trimmings, beadwork and everything. They’re good skin sewers in the Siberian lands. They used to exchange some things with Siberians, not with money but with things like that [boots]. Beads this long [approximately twelve inches] cost a whole walrus skin. I think those Reindeer people used it instead of reindeer skin for their summer dwelling. As you know, they are nomads. They’re traveling all the time. I remember my beads — I lost them when I was a little girl — my grandfather bought them with a piece of rope and one dried walrus skin from them, expensive beads. Estelle Oozevaseuk: I think this [upper] is of reindeer, the leggings. They tan them by hand, very good tanners. To soften it, I think they use reindeer manure. They just wet the inside — the skin side — they smear it. And then fold it up and put it aside. And when the dampness goes through it, they work on it with their hands. So their hands are kind of rough here [between thumb and forefinger] from working the skin.I watched when grandma would tan that [skin], she just moistened it and then smeared a little bit of [seal] oil on it that made it supple. And when they are done — as you know Eskimos have no measuring tapes or anything — they use their hands from thumb to middle finger for measuring. They’re good skin sewers. We use seal skin and bleach it. We wash the oil out after taking the blubber off, wash them in water. When they’re done, they just fold it up and put it somewhere [soaking in water] until the [hair] comes off. Every day they change the water until the odor has been [washed out]. And then when the water stays clear, they just stretch it. It took a lot of work to do it. It’s hard work. When we’d make a big one, it’s hard. It took a long time to dry them, the thicker skin. Thinner skin dries more easily. A long time ago, they never stretched it. My grandmother, she used to make a little poke — blow it up [a hide skinned whole] — and let it freeze outside and hang it on the racks until it dried. I used to make pokes. Grandma taught me a lot. As soon as the skin was off the seal and turned inside out, she let me blow it up, just like a big balloon. And I would start to take the blubber off the skin. It’s hard to do. And they scrape it again when it’s dry. They never keep it in a warm place inside the house when it’s first dried, because the yellowness soaks through to the outside of the skin. So they keep it in a cold place for a good while until it’s all dried up and can’t soak through. And they were very careful about using it, even the little scraps were saved for trimmings for some kind of other color and for balls. And they tried to buy some reindeer mane hair from Siberia and use it for balls too. Estelle Oozevaseuk: In between [sole and upper] there is white leather for waterproofing, aamqun [strip of bleached sealskin folded and sewn between the sole and leg of the boot]. (2) And this part [base of strap] is dyed, a tree bark dye this color [red-brown]. They got tree bark from Siberia too, where the women used to do that. Their friends brought them sometimes. They bought some sometimes and used it. When they make this kind of skin, they put the tree bark in hot water for a good while, and then they roll it [skin] up and soak it in water for a little while. They have sewn all the openings in that skin. I did that all the time when I was making boots, when somebody asked me, some years ago when I was younger. We always used to rub the skin until it dried. We put it up and rested for a while, and then we started to rub it again. And then when we opened it up, it had turned to a color like that [red-brown]. And we dried them, but not too dry. While it was still damp, we took it down and fleshed it with a fleshing knife and straightened it. And then we’d use it. Jacob Ahwinona: The soles on those, they used their teeth to make these. Estelle Oozevaseuk: Yes. Boy, I have worn out my teeth, because I learned [how to do] that from my women neighbors. And this is like Saint Lawrence Island type of [crimping on sole], so it came from Siberia. And this [sole] is maklak [bearded seal] skin. I have worked on those so many times. My women neighbors always ask me [to make soles], because they’re not good at doing that. We just cut a piece and soak them in the water. When they soak through, we put them under [the flooring] — a long time ago, they used to have walrus skin flooring. Then we took them out and cut them just in a good shape. First, we make a little bit of this border for [top edge where sole meets vamp]. It’s for sewing to the top [vamp]. And then we start it from here [toe]. And before it dries too hard, when it’s still damp, we sew them on [sole to vamp]. Estelle Oozevaseuk: They use sinew for here. We make very narrow sinew thread, mostly from reindeer sinew. We put a colored thread outside of it for the string, and we call it sagniin [twined thread sewn between stitches to keep the stitches from cutting through the skin]. (3) This is whale [sinew], it’s kind of a rough. Reindeer sinew is soft. Somebody was a good sewer [because she sewed] with small stitches. We tried to make the stitches tight on the bottom sides [where sole meets vamp] when we sewed, especially for water boots, so there’s no leaking. The white thing [welt] is aamqun [strip of bleached sealskin folded and sewn between the sole and leg of the boot]. This [thread] we use for the bottom is natiin [heavy twined thread made from sinew used to sew a boot sole onto the vamp of a boot], because this is nateghqaq [sole of a skin boot].And this one singightuqisiq [rectangular piece of shaved sealskin to be sewed to the end of a bootlace], because this is singiq [bootlace/boot strap]. Another part here is nungighsiin [folded-over strip where a drawstring is put]. (4) [The stitches are] temli [running stitch used to attach boot vamp and upper]. And for those little ones, we use kaleftaq [small running stitch]. 1. See discussion of gut parka 123404.000. 2. An aamqun [strip of bleached sealskin folded and sewn between the sole and upper of a boot] is called a welt in English. 3. According to St. Lawrence Island Yup’ik Elder Vera Kaneshiro, sagniin [twined thread sewn between stitches to keep the stitches from cutting through the skin] is a running stitch used with overcast stitch, which is used when making a waterproof seam between a boot sole and vamp. The thread used was made from sinew then from the string that came on flour sacks. Reindeer leg skin boots like these are very warm, for winter use. The uppers are pieced together from reindeer legs, requiring four legs per boot. (3) The white band around the tops is bleached reindeer or seal. 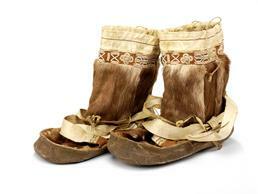 In the past, reindeer hides for making boots and winter clothing came from Siberian Yupik kinsmen who traveled by skin boat to St. Lawrence Island from Ungaziq (also called Indian Point or Chaplino), Nevuqaq (East Cape), and other villages on the Russian coast. (4) In 1900, reindeer herds were established on the island.